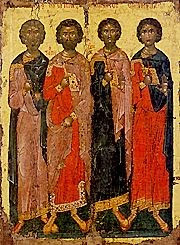 The Holy Martyrs Eugenios, Candidus, Valerian and Aquila suffered for their faith in Christ during the reign of Diocletian (284-305) and Maximian (305-311), under the regimental commander Lycius. Valerian, Candidus and Aquila had hidden themselves in the hills near Trebizond, preferring life among the wild beasts to living with the pagans. They were soon found, however, and brought to Trebizond. For their bold and steadfast confession of faith in Christ the holy martyrs were whipped with ox thongs, scraped with iron claws, then were burned with fire. Several days later St Eugenios was also arrested, and subjected to the same tortures. He boldly destroyed the statue of Mithras through his prayers, which had long been the subject of adoration to the peole of Trebizond, on Mount Mithrios, now Bouz-tepe, that overlooks the city with its wall of rock. Later, they poured vinegar laced with salt into his wounds. After these torments, they threw the four martyrs into a red-hot oven. When they emerged from it unharmed, they were beheaded, receiving their incorruptible crowns from God. They were martyred under Roman Governor Pontitus Catinius Coresinus in 304 AD. The remains of St. Eugenios were buried in the Potters Cemetery in an unmarked grave, yet remembered by Christians who treasured his memory for his sacrifice. 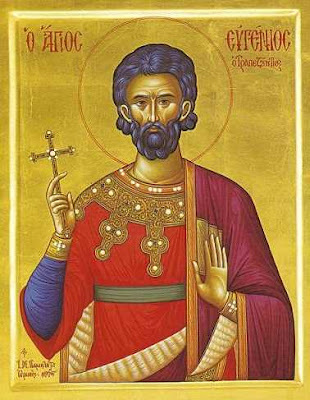 In the year 326, after Christianity became the official religion of the Roman Empire, a shrine was built over the unmarked grave of Eugenios and cared for by Christians in Trebizond. Under Justinian in the 6th century Procopius informs us that an aqueduct was built in Trebizond named after St. Eugenios. 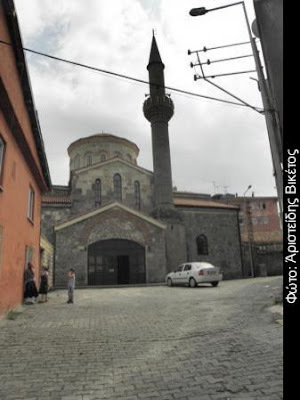 In the year 812, a church was built in Trebizond and named after the martyr St. Eugenios. The martyrdom of St. Eugenios took place at an isolated point between two ravines that separate the upper citadel and the great eastern suburb. His remains were moved here from the shrine in Potters Cemetery to the Church of St. Eugenios built over the place of his martyrdom. 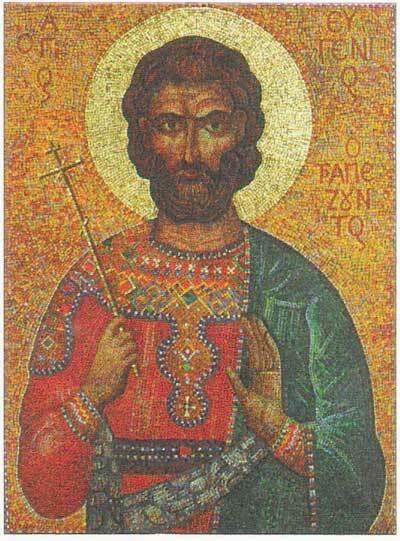 In 1057 A.D., Isaac I was proclaimed Emperor of Trebizond. Having learned of the martyrdom of Eugenios, the Emperor renamed his palace guards the “Palace Guards of St. Eugenios.” The oldest life of the saint dates to eleventh century Constantinople. In the year 1450, Alexius III rebuilt the Church of St. Eugenios into a glorious Basilica, attaching to it a monastery that would also bear the name of St. Eugenios. The remains of St. Eugenios were given a place of honor in this new church. St. Eugenios was chosen by the emperor and people of Trebizond to act as their advocate in heaven and their protector on earth. His name and veneration served to separate the citizens of the empire of Trebizond from the citizens of the empire of Byzantium. The buildings dedicated to St. Eugenios were more than once destroyed amidst the revolutions of Trebizond; but a Christian church, now converted into a mosque by the Osmanlis, and called Yeni Djuma djami still exists. The effigy of St. Eugenios was also impressed on all the silver coins of Trebizond. * The festivals of St. Eugenios became the boad of social communication between the emperor and his subjects: the biography of the saint was the textbook of Trapezuntine literature; his praise the subject of every oratorical display; his name the appelation of one member in every family, the object of universal veneration, and the centre of patriotic enthusiasm. 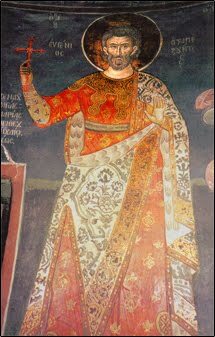 The religion, the literature, and the politics of the inhabitants of Trebizond, during the whole existence of the empire (1204-1461), identified themselves with the veneration of St. Eugenios. The memory of St. Eugenios is kept alive at Dionysiou Monastery on Mount Athos from 1375, since the monastery was founded by Emperor Alexios III of Trebizond (1338-1390). He is celebrated both on January 21, the day of his martyrdom, and June 24, the day of his birth. * No coins of Alexios I and Andronikos I have been identified, but all the known silver coins of Trebizond bear the effigy of St. Eugenios on their reverse. The earlier coins represent the saint on foot as the spiritual guide and shepherd of his flock. 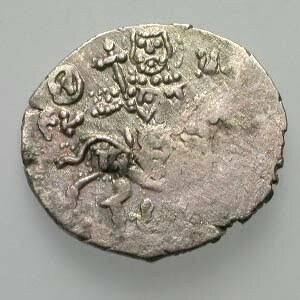 The later coins display him on horseback with a cross in his hand, as a man-at-arms, ready to protect the city. Your holy martyr Eugenios, O Lord, through his sufferings has received an incorruptible crown from You, our God. For having Your strength, he laid low his adversaries, and shattered the powerless boldness of demons. Through his intercessions, save our souls!